The Gadgeteer excels at presenting himself as a one-person battle force, at least for a short time. Using both the latest tech and his own personally-modified gear, a Bounty Hunter with this specialization can be hard to stop. 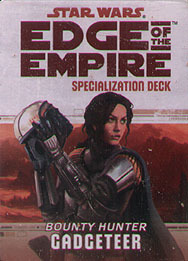 This deck requires the Edge of the Empire Core Rulebook and includes cards for all 20 talents available in the Gadgeteer specialization.